THIS ARTICLE CONTAINS THE STATS, STRATEGY, AND GUIDE FOR CASTER - CU CHULAINN (CASTER). WE WILL UPDATE THIS AS SOON AS THE GAME COMES OUT. Cu Chulainn Caster appears in Fate/ Grand Order as a three star Caster class servant. In Irish mythology, Cu Chulainn Caster becomes a master of runes. Cu Chulainn Caster is an alternate form to Cu Chulainn, the Irish Hero of the Ulster Cycle. In this form, Cu Chulainn Caster appears as the legend in which Cu Chulainn became a master of runes. He also appears as Caster (Fate/ Grand Order) in the Fate/ Grand Order series. Overall, he is a 3-star servant under the Fate Grand Order Caster List. Upon completing Fuyuki, players receive Cu Chulainn Caster’s aid as a reward. He also has other forms such as Cu Chulainn Berserker, Cu Chulainn (Fate/ Stay Night), Cu Chulainn (Fate/ Prototype). Cu Chulainn Caster is one of the few Caster class servants that have a form of self-sustain. Like any other Caster class servant, he also has 3 Arts Command Cards in his deck. Cu Chulainn Caster’s Rune Spell ability allows him to quickly regenerate his NP gauge. However, he needs a Quick-card focused servant to grant him higher chances of inflicting Critical Hits. Medusa can help him with that as a Rider class. At the same time, she can stun enemies and give Cu Chulainn Caster more time to boost his NP Gauge. Altera can boost Cu Chulainn Caster’s noble phantasm – Wickerman. Especially because he’s a three star servant, Cu Chulainn Caster has an easier time boosting the power of his noble phantasm compared to others. Make sure also to get Cu Chulainn Caster’s Divine Protection skill. This skill is what contributes to majority of his sustainability as a Caster class servant. William Shakespeare‘s Enchant is useful for Cu Chulainn Caster as it boosts the power of Wickerman. Zhuge Liang can use Discerning Eye to quickly push Cu Chulainn Caster forward for a quick Wickerman summon. Heaven’s Feel will give him an advantage especially in NP damage. At the first part of the game, he may become your main cannon so granting him this CE can increase his damage. If you’re still using Cu Chulainn Caster later on, other CE such as Halloween Princess can also help. Not only does it grant him an extra 30% charge on NP but increases his NP damage by 15%. Victor of the Moon not only boosts his Buster card effectiveness but also his critical strength which can stack with Cu Chulainn Caster’s Rune Spell. Rune Spell A 3 7 Increases own critical damage for 3 turns. Increases own debuff resistance for 3 turns. Primeval Rune – 3 7 Increases own critical damage for 3 turns. Increases own debuff resistance for 3 turns. Increase own NP charge. Divine Protection from Arrows A 3 7 Grants self evasion for 3 hits. Increases own defense for 3 turns. Disengage C – 7 Removes own debuffs. Recovers own HP. Reduces all enemies’ defense for 3 turns. Burns all enemies for 10 turns. Every servant has an interlude. 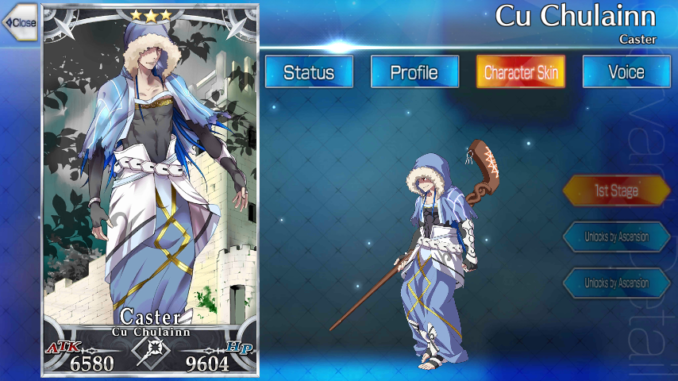 Each servant’s interlude can either bolster a servant’s skills in combat or unlock certain voices in their profile page. While Cu Chulainn was known for being a spearman, very few acknowledge Cu Chulainn Caster as a rune specialist. During the Ulster Cycle, magic had become common use especially in the form of weapon enchantment. From then on, Cu Chulainn Caster stayed in the forest where he gained the favour of different forest spirits and runes. Eventually, Cu Chulainn Caster became a potent magi becoming the wielder of one of the most powerful runes of his time – Wickerman. However, other legends say that he learned his spells from the Lady of Shadows herself, Scathach. As her student, he not only learned how to fight using a spear but also with runes – an ancient form of Norse magic. With that knowledge on hand, he could easily enchant his weapons and fight on par with those who have magical abilities. One of his most iconic battles is his battle with Medb. Despite her seductive charms, Cu Chulainn Caster survived her charms not only because of his knowledge in runes but him not being Ulster born as well.